Emily Hubbel: What Does the Fox Say? This has been in my head ever since yesterday morning when Emily was in her scan. She was having a hard time sitting there and her toes were bothering her, so I was trying to get her mind off of it. So she wanted to hear "What Does The Fox Say?" One of her nurses helping with the MIBG scan, actually dressed up as What Does The a Fox Say, so she was excited to hear her favorite song. Lol. Daddy and Brianna packed up the van while Emily was in her scan, so that when we were done meeting with Dr Sholler we could just leave. Emilys counts were checked again since her hemoglobin dropped so much from last week, but yesterday they were 8.7, so they did drop, but not enough to require a blood transfusion. We haven't seen her hemoglobin drop that much since May when she needed a transfusion. So we are hoping that it goes up on her own. But also waiting to hear from Dr Gowda if we need to come in early next week. So, the results. I know everyone has been waiting for the results, but we didn't leave Michigan till about 215pm yesterday, so we didn't get to Pittsburgh until about 9 and honestly we were all exhausted, needing to eat dinner and daddy and Brianna not feeling well. HMA and VMA were within normal range, not sure about LDH but no one said anything. Scan results show stable, meaning no new spots. The results Show avidity in right skull base near the soft tissue abnormality on CT. (We have never had anything show on the CT so this is new, but not new because shows on MIBG). Increased activity along the floor of the bilateral middle cranial fossae and proximal left femur. All the other previous spots that she had before are still there with no change. What does this tell us? It says that the current regimen that Emily is on is no longer working and only keeping her stable. Which is obviously what we want, keeping it stable. But I have to be honest we wanted more than that, we have always wanted more than that. We also know it's no longer working when some of her spots are brighter than they were before. So what can we do moving forward? We really have no idea what we want to do moving forward. Obviously our goal is still NED. Both Dr Sholler and Dr Gowda do not recommend not doing anything at this time. When Emily was first diagnosed there was no trying to figure out what trial to put her on or what was next because there was a protocol already set for us. There is no longer a protocol anymore and now as parents you just have to decide what is the next best course. What are you willing to put your child through and mor traveling or what have you. We don't have a plan, we will meet with Dr Gowda on Thursday at 9 to discuss what our possible next moves are. It's a possibility she could lose her hair again, so we would need to prepare school, her classmates ands letters home to parents of her class if we go this route. So we have already started telling Emily about this. So we will need to get hats again if we go this route. Please don't get us wrong, stable is great in the grand scheme of things. What we didn't want was progression of more spots, thankfully that didn't happen. But our hearts want so much more than stable. Emily wants more than stable. We just don't have an end in sight yet. Isn't 3 years enough of battling with this stupid disease. But we are thankful that Emily is our fighter and handles it all so well. She is such a big girl and wise above her age. Once we have a plan, we will update. 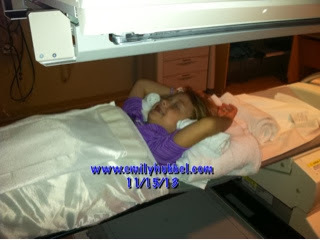 We will take Emily to clinic earlier than Thursday if Emilys energy levels go down or bruising. Make sure to hug and kiss your kids and tell them how much you love them. I am so glad to hear there is no progression. Thank You Father. Praying for you decisions that need to be made and seeking NED always!